NOW AVAILABLE! SAH-22HC with HARD TRAVEL CASE! The Series SAH SMART Air Hood® Balancing Instrument is the most accurate and easy to operate air flow hood on the market. By using the included hood stand and wireless communications to the handheld, a single operator can balance a branch in less time than traditional balancing teams. Besides being lighter than most traditional capture hoods, the ergonomic design makes the Series SAH easy to maneuver, with less physical stress. The rugged polypropylene base hood features Quad Flow Design Technology for controlling air flow and minimizing back pressure, which yields superior measurement accuracy. The Wi-Fi direct communication gives reliable communication with a distance of up to 200 yards (183 m) between the hood and the handheld test instrument. The SMART Air Hood® Balancing Instrument includes the PredictAir™ Application Software which reduces the number of steps in the air flow balancing process using Predictive Balancing’s Express Balance mode. Predictive Balancing is a method of predicting the optimal flow set point for each register and the order in which they should be adjusted. DID YOU KNOW Dwyer offers calibration services? Contact Customer Service for more information. Note: For full functionality and versatility, the A-SAH-12P is required for operation of all SAH models. Dwyer Instruments, Inc. was recognized for excellence in product design in the 13th and 14th annual Dealer Design Awards Program sponsored by The Air Conditioning Heating & Refrigeration News magazine. An independent panel of contractors acted as judges in the contest that had over 80 entries. The company’s SMART Air Hood® Balancing Instrument was the Bronze Award Winner in the Testing and Monitoring product category and the PredictAir™ Application Software was a Gold Award Winner in the Contractor Services and Software category. The ACHR News is the leading trade magazine in the heating, ventilating, air conditioning, and refrigeration industries. To read the full announcements, please visit http://www.dwyer-inst.com/DDAWinners. SMART Air Hood® balancing instrument. Includes: 2' x 2' hood with NIST certificate, handheld test instrument, 3' pole assembly, and travel case. SMART Air Hood® balancing instrument less battery. Includes: 2' x 2' hood (less battery) with NIST certificate, handheld test instrument, 3' pole assembly, and travel case. Supply: 40 to 2000 CFM (68 to 3398 m3/h) (19 to 944 l/s); Exhaust: 80 to 2000 CFM (136 to 3398 m3/h) (38 to 944 l/s). ±3% of reading ±7 CFM (11.9 m3/hr) (3.3 l/s)*. 1 CFM (1.7 m³/h) (.5 l/s). 3.6 V NCR18650B MH12210 lithium ion battery, included, user replaceable or (4) 1.5 V AA alkaline batteries, not included, user replaceable. Where do I go for help on how to use the SMART Air Hood®? The Dwyer website is an excellent source for product information. 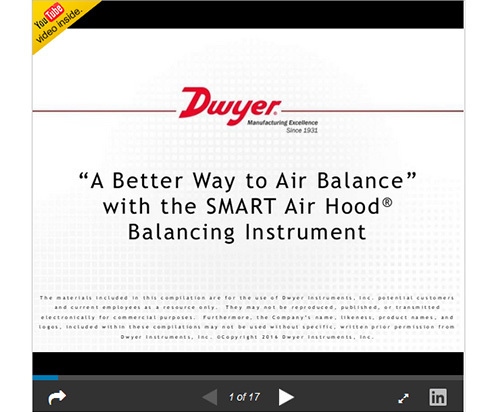 Videos are available illustrating the SMART Air Hood® features and benefits as well as how to use for balancing. In addition to the Dwyer website, the Dwyer Technical Support Team is available to take your phone calls and assist with questions. Please visit www.dwyer-inst.com for contact information and technical support on the SMART Air Hood®. What type of battery is in the SMART Air Hood®? The SMART Air Hood® operates with a NCR 18650B MH12210 lithium ion rechargeable battery, 3.6v. In addition, 4 AA batteries can be used as backup so the SMART Air Hood® is always available for use. Can the SMART Air Hood® accommodate various size diffusers? Yes, various size canvas hoods with an adaptor are available as accessories for the SAH Consult the Dwyer Instruments website, www.dwyer-inst.com for details. Can I store my results for future reference? Yes, the SMART Air Hood® mobile meter includes job based logging that will track the entire balancing process from beginning to end including a balance summary that shows the actual final flow at each register and the deviation from target. Each branch is considered a job. All of the registers for a job can be setup ahead of time and distributed prior to performing the balance. Setup and modifications to the setup can also be done onsite. Jobs can be paused and resumed allowing for additional activities, breaks, maintenance, without disrupting the balancing process. What is the range of the handheld device that comes with the SAH? The SAH uses Wi-Fi Direct for communications. Wi-Fi Direct allows the SMART Air Hood® to create a Wi-Fi connection directly to the Dwyer handheld instrument. There is no need for additional equipment needed, like a router. The range is up to 200 yards. Can it be shipped as air freight to the job? Yes. The SMART Air Hood® is shipped with a protective carrying case durable enough to be shipped air freight. Please note that there are shipping restrictions for lithium batteries; consult your carrier prior to shipping. Dwyer’s SMART Air Hood® is a revolutionary crate design made from a rugged polymer construction. The lightweight design represents the smallest and most aerodynamic design the industry has ever seen. The SMART Air Hood® weighs less than 6 pounds and ¼ the height of current industry air hoods at 24"x24"x12". Is a protective case provided for the SMART Air Hood®? Yes, the SMART Air Hood® is shipped in a protective travel case as standard. The price is included, there is no extra charge. Recalibration of the SMART Air Hood® is fast and easy. Dwyer recommends recalibrating the Hood, at a minimum, once a year to ensure maximum performance. When it is time for recalibration, simply detach, by unclipping the clamps on all four sides, the four Quad Flow Sensing Grids along with the Sensor Module. The Quad Flow Sensing Grids and Sensor Module need to be calibrated together. For your convenience, Dwyer includes with each purchase of a SMART Air Hood® a custom return calibration package specifically designed for the four Quad Flow Sensing Grids and Sensor Module. 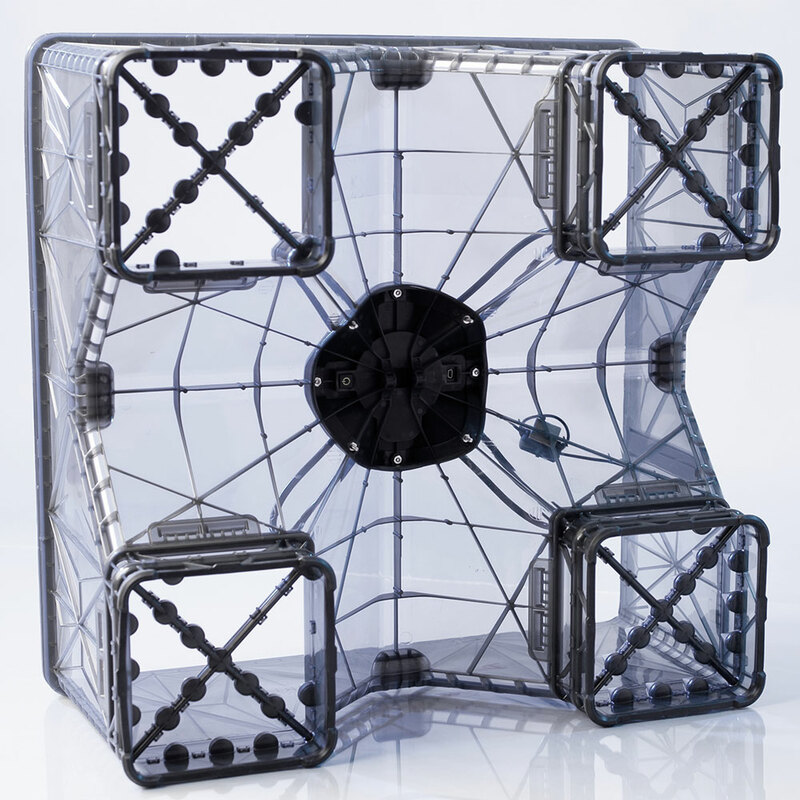 To ensure no downtime, you can purchase a new set of four calibrated Quad Flow Sensing Grids and Sensor Module, model A-SAH-CK part number 100765-09, ready to install on the jobsite. You can return the original four Quad Flow Sensing Grids and Sensor Module in the custom return package to Dwyer using our RMA process or to any authorized Dwyer calibration service company. Once The Quad Flow Sensing Grids and Sensor Module are calibrated, they will be returned as a set back to you, ready to install on your SMART Air Hood®.